Happy Hump Day! It’s 4:17AM and I’m sipping coffee and sitting in an almost empty house. Our contractor starts our home renovation today. I’m excited, stressed, tired, and all the things! Needless to say, I didn’t sleep that great last night because my mind was racing. So, here I am, bundled up with my laptop sharing the Loft’s Friends & Family Sale! Loft has 40% OFF your purchase with code FRIENDS. 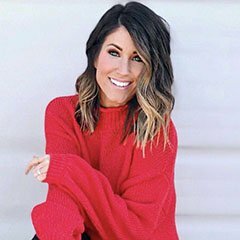 I stopped by there a few days ago so I’m sharing what I loved (and what I didn’t love) in this post. My store didn’t have many dresses or work wear sizes left, but I definitely recommend browsing those sections online if you’re in search for either of those things! P.S. 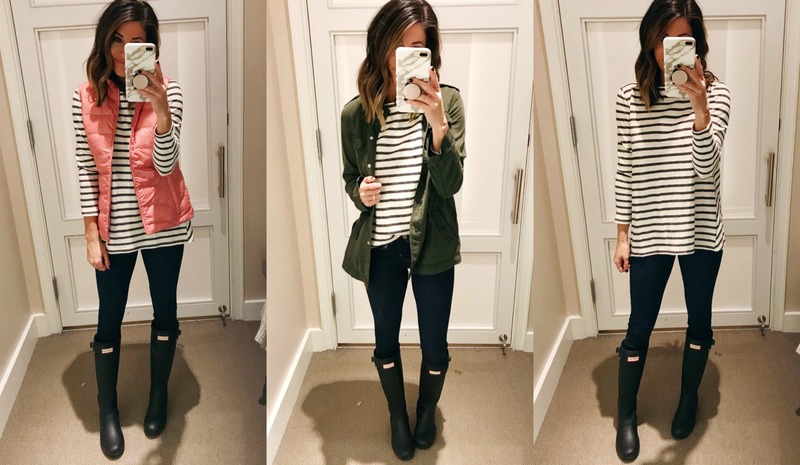 It was pouring rain the day I went into the Loft so I’m wearing my Hunter Boots and leggings in most of the pics. 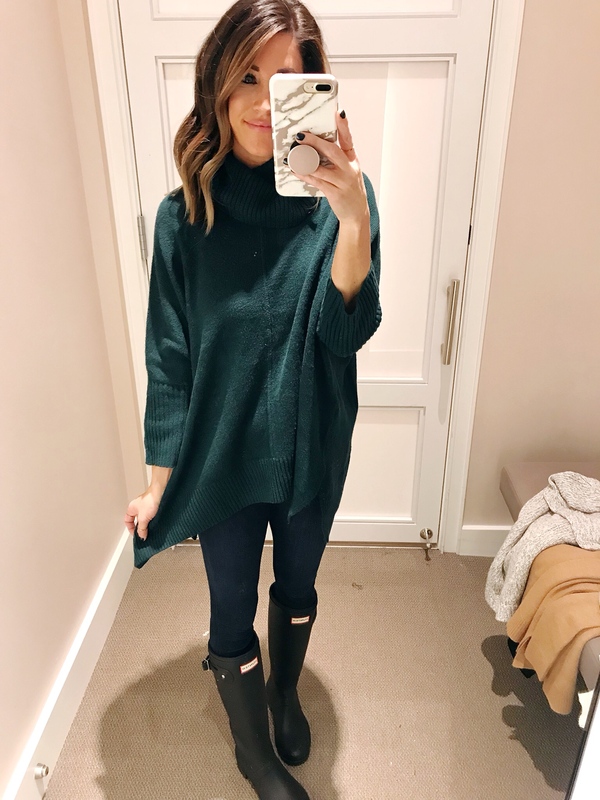 Turtleneck Poncho Sweater: I love the color of this; I think it could be great for the holidays! I think these are great to wear over a long sleeve fitted tee for extra warmth when it gets really cold. If you’re shorter than 5’4″, you could probably wear this with leggings. This could be great for teachers! I think it’s flattering and comfy. I have a similar one also (that I’m sharing below). I’m wearing an xs. This is available HERE. 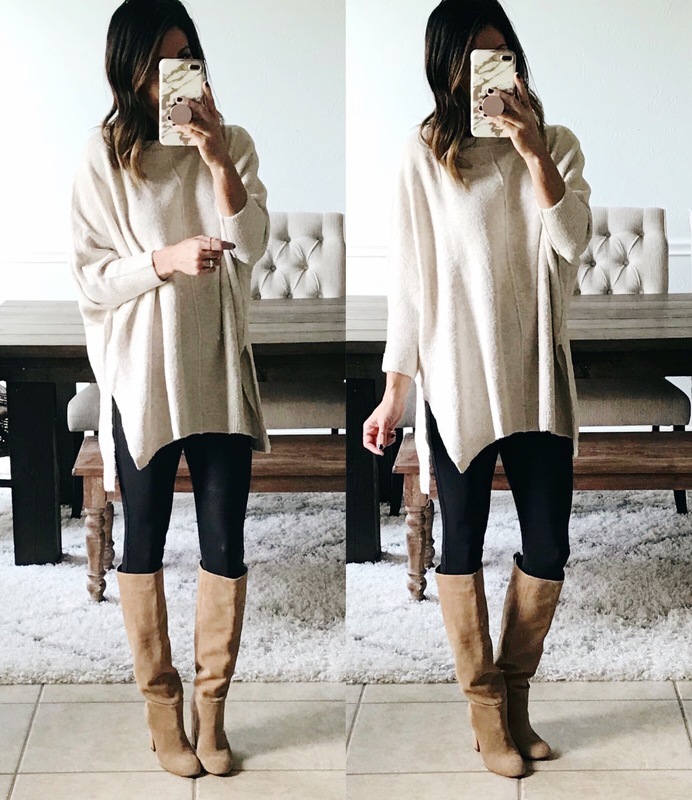 Mock Neck Tunic Sweater: I really wanted to like this because the length is great and the color is so perfect for fall, but this sweater is ITCHY. Unless you plan on wearing something underneath and/or incredibly itchy garments don’t bother you, I would definitely pass on this. I’m wearing a size small and it’s available HERE. (Similar, NON itchy option HERE). 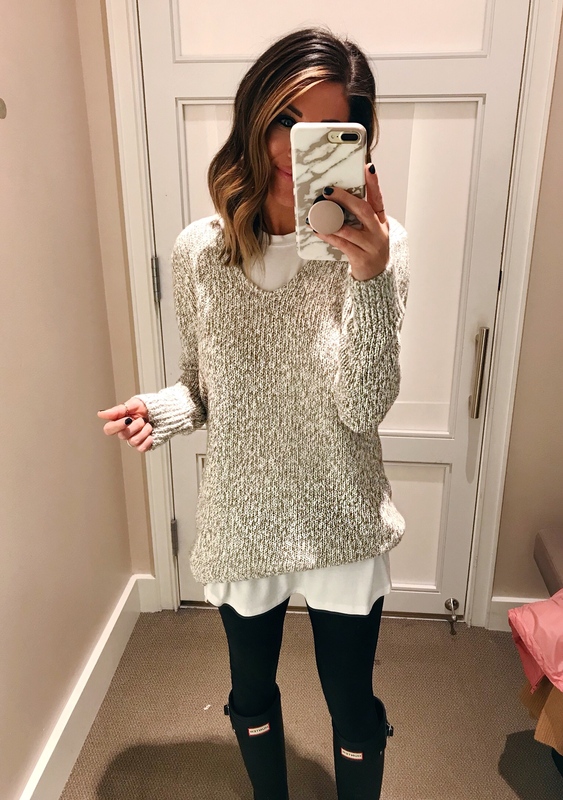 Marled V-Neck Sweater: I LOVE THIS! This was one of my favorite items! 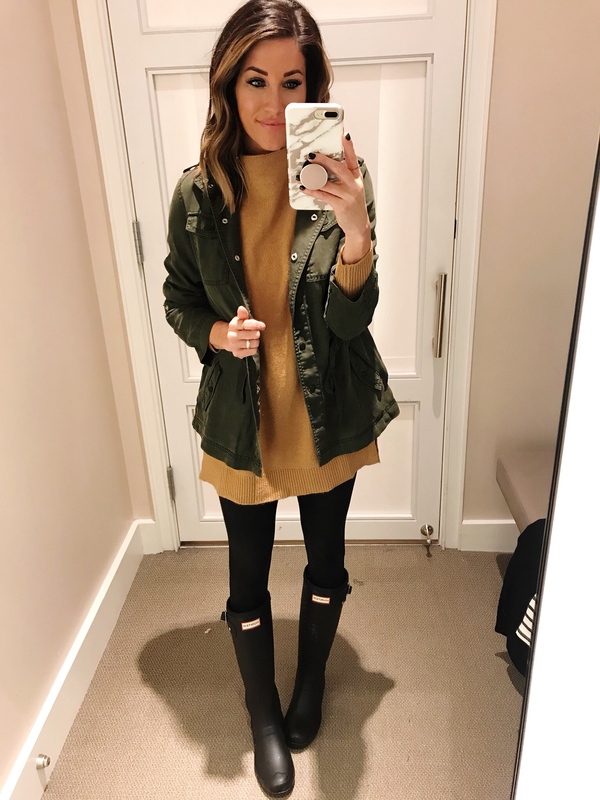 I tried on the xs and the small and I liked the small better! This also comes in other colors, but I love the grey! 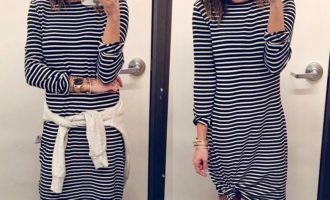 It’s great quality and can also be worn off-shoulder (if you size up one). This definitely came home with me! I’m wearing a size small; this is available HERE. Striped Tulip Back Sweatshirt: The cutest part about this striped sweater is the back, that I failed to successfully take a picture of! This is a good quality sweater and I think it nice enough to wear to the workplace. If you’re between sizes, I would go up one in this. I’m wearing a size small; this is available HERE. 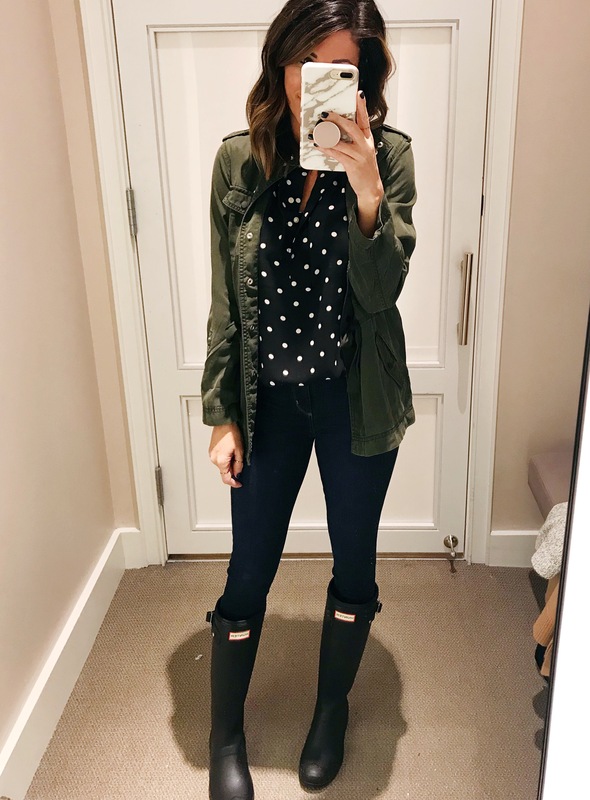 Polka Dot Blouse: I really liked this, but I haven’t been able to find it online. I’ll definitely keep an eye out! For reference, I’m wearing an xs. Flecked Ribbed Sweater: This is a thick, very nice quality sweater. It hits you at your hips and the fit is just right. 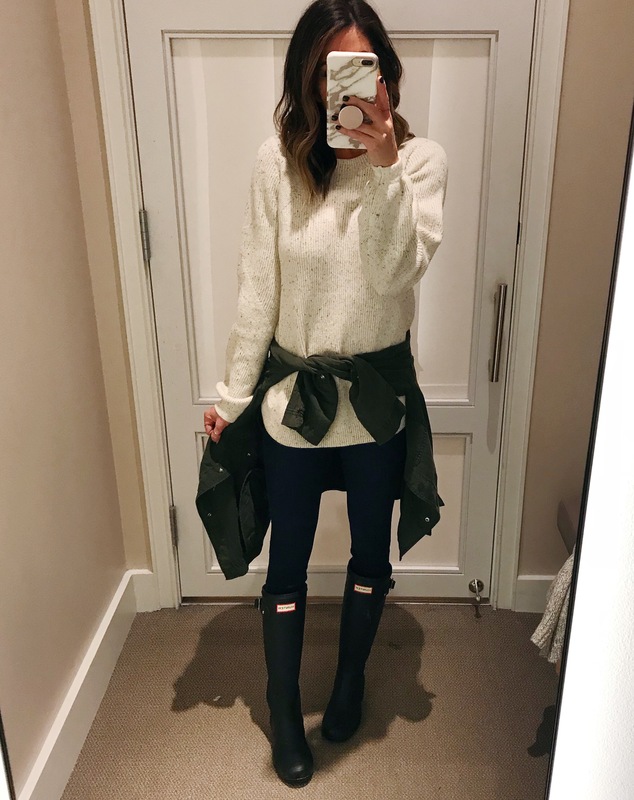 It’s not too snug or too bulky…it really is a nice quality, nice fitting sweater! I’m wearing an xs and it’s available HERE. 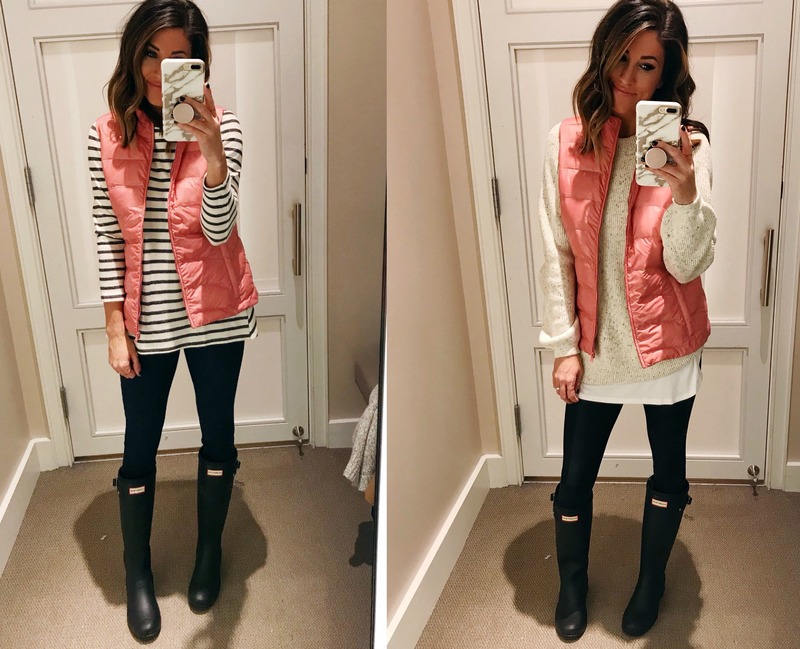 Pink Puffer Vest: I don’t think I’ve seen this color puffer vest anywhere else! I know this color may not be for everyone, but I definitely think it’s prettier in person than it is in these pictures. It’s cozy and has pockets! This is an xs and it’s available HERE. 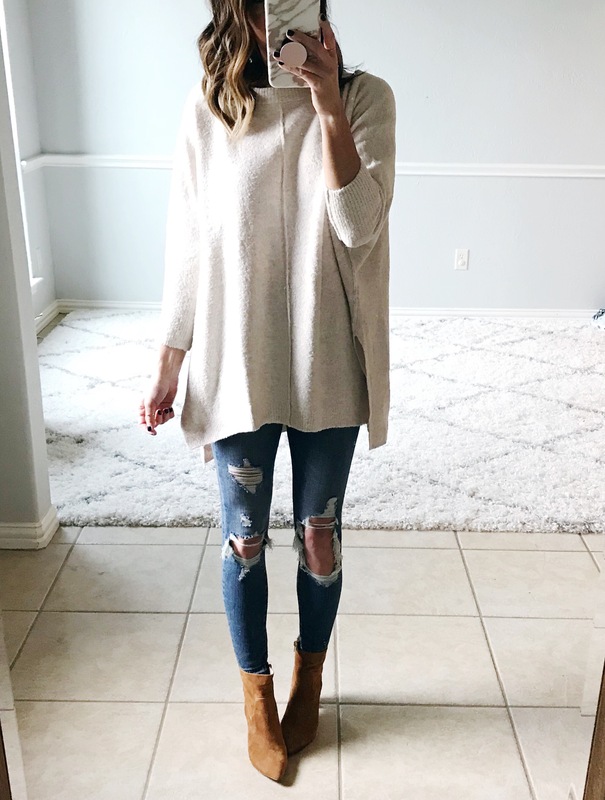 Stitchy Tunic Sweater: I purchased this during the last Loft sale and I LOVE it! 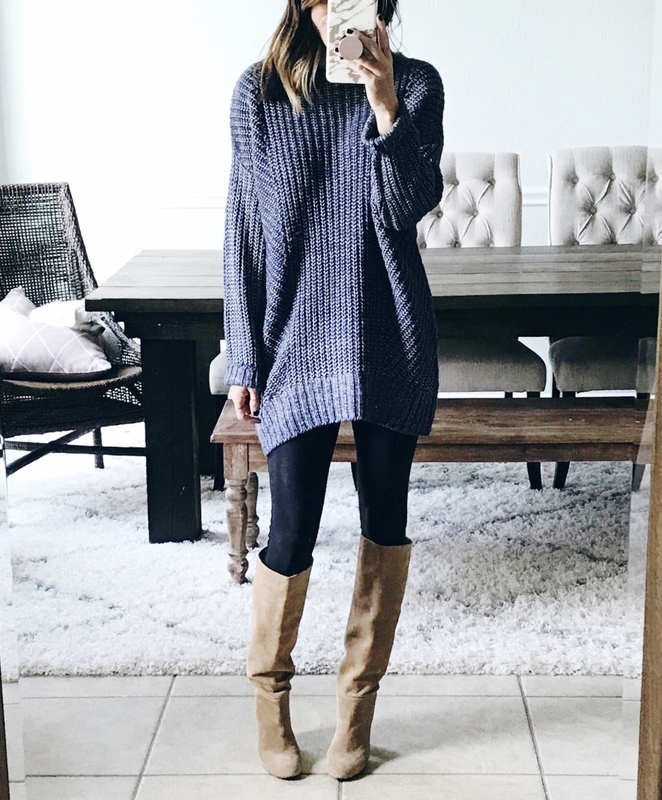 It’s oversized and great for leggings! I also think the color is really pretty and I love the texture! I also think this could be maternity friendly. I got an xs; this is available HERE. 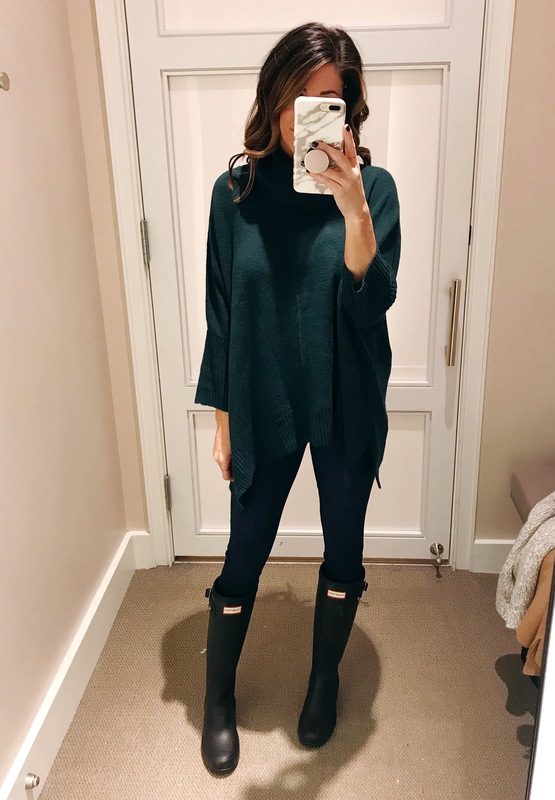 Seamed Poncho Sweater: This is another NICE quality sweater and another one that would be great paired with a fitted long sleeve tee underneath when the temps get really cold. I grabbed this during the last Loft sale. It’s really popular right now; I’ve seen it ALL OVER social media! 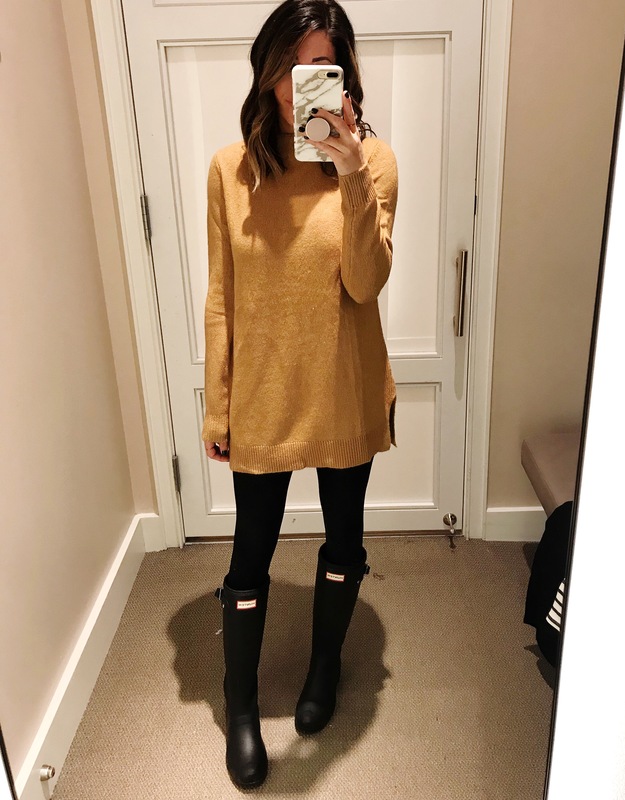 This poncho sweater has really good reviews and also comes in yellow. 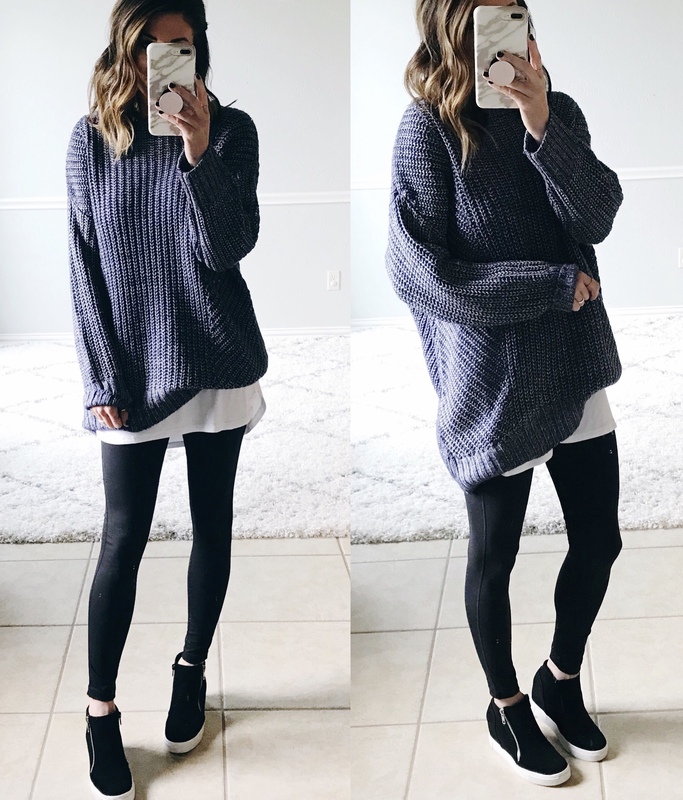 If you’re shorter than 5’4″ you should be able to wear with leggings. I am wearing the xs/s regular; snag one HERE. Stitchy Blouson Cardigan: I LOVE the color of this cardigan! I’ve had it for awhile and it’s held up great! It has an oversized fit, nice texture, and pockets. It also has GREAT reviews! I’m wearing an xs; grab one HERE. USE CODE FRIENDS AT CHECKOUT FOR 40% OFF! 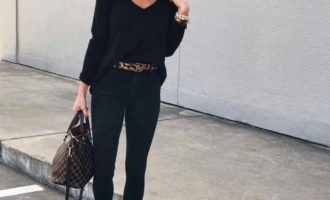 The Loft jeans I was wearing in some of these pics fit true to size and I was wearing the petite length. They can be found HERE. Shop Loft Plus Size HERE. Great post! I lol’d at “or incredibly itchy garments don’t bother you.” Hahaha!! Thank you so much! Hope you’re having a great week! 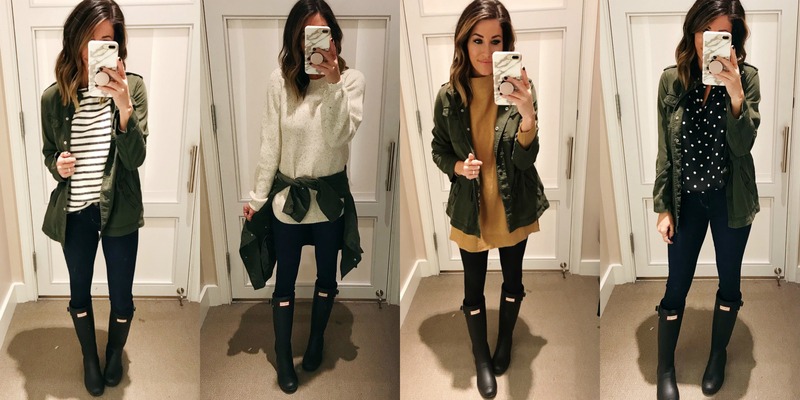 What are your favorite black target leggings? That’s so funny… I’ve had the marked sweater in my shopping bag and have been debating on the flecked sweater lol! Did you def like the marled better? I wish I could find s free shipping code! (I’m not near a store ☹️). the black polka dot blouse is up! Oh my gosh! I can’t believe I missed the sale! I’m pretty sure my closet is primarily Loft! I need to update my sweater collection! I need to go check out these sweaters!